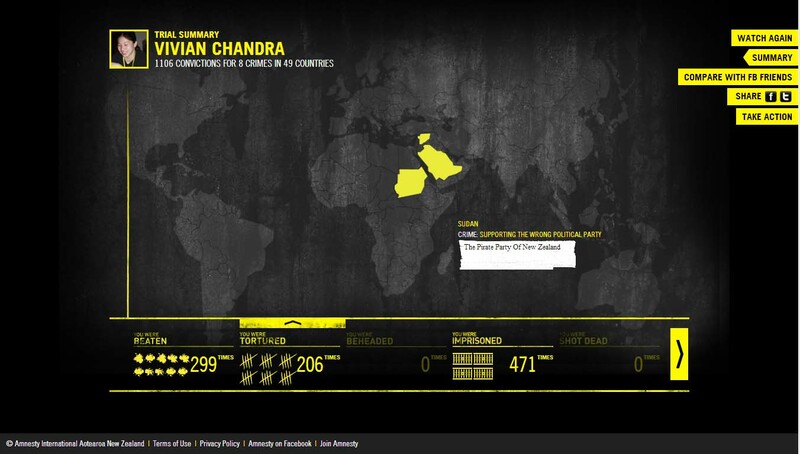 I’ve been sentenced for 1106 convictions for 8 crimes in 49 countries. Beaten 299 times in 3 countries, tortured 206 times in 3 countries, imprisoned 471 times in 3 countries, lashed 4 times in 2 countries, stoned to death once in 1 country, killed by extremists 366 times in 2 countries, and persecuted 604 times in 2 countries. What am I talking about?! You guys have probably worked out by now that I work for Amnesty International NZ. Our amazing digital comms team launched a unique new tool this week that I’m frankly, quite excited about! For the geek readers out there, the tech learnings were huge (and we are still working through some of those). The whole thing was developed by Colenso BBDO (the same firm that did the Good Money Bad campaign for BNZ lately) for free! (which is damn awesome) and being hosted by Xplain Hosting for free! (also pretty damn awesome!) – their links are below if you need them for your next HUGE tech project. It is created on PHP/MYSQL and hosted on Amazon’s EC2 cloud. Don’t ask me anymore, Colenso BBDO and Xplain Hosting did the rest! We’ve also had some pretty cool pickup from traditional media through to blogs and twitter/facebook! So, if you haven’t given it a go yet, please do. I’ve been round the non-profit lot for a while and I can definitely say that this is quite a unique concept, it really drives home that blogging and freedom of expression is very different depending on where you live. What i’ve had a few friends say is how creepy the whole thing is… it scans your entire timeline and it seems to do it right before your eyes. Yes, it is creepy, because we live in a country where this kind of thing is not tolerated, where our right to privacy and freedom of expression is enshrined in all sorts of legislation… but what if you didn’t?